Lately 3B Box has been my main source for Asian beauty products. I've been trying to make a dent in my growing pile of skincare items so I've really cut down on the number of monthly subs I get. I hate throwing away items once they're opened - even if I don't like it - so I end up keeping everything and trying to use it all up (of course if something causes an adverse reaction that's grounds for tossing it but thankfully I haven't run into that problem yet). I decided to keep 3B because I like that you get enough of a sample to see if you like it, but not necessarily the full size version. That way I can use up everything and have the option of purchasing more of something I absolutely love. Plus it's one of the most affordable K-beauty subscriptions out there. 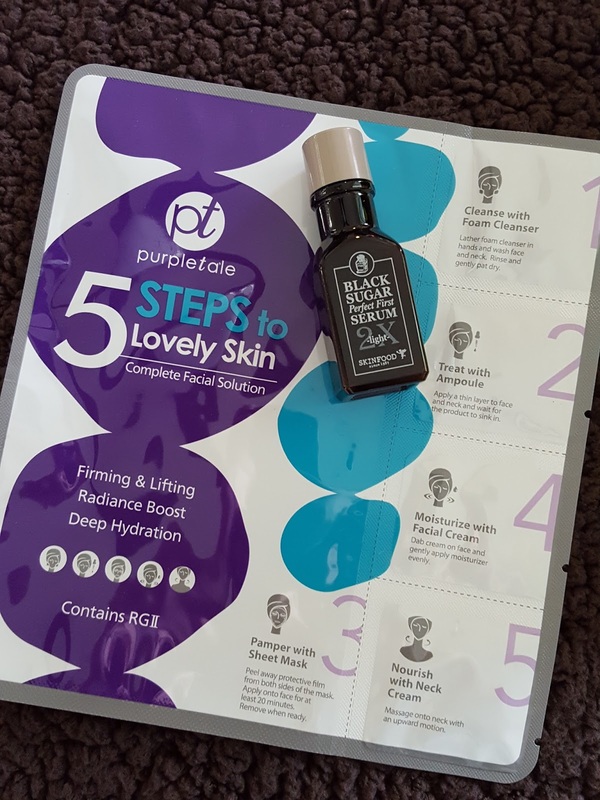 Purpletale 5 Steps to Lovely Skin Sampler - Ooh this is convenient. Korean skincare can be pretty overwhelming at first because there are so many steps, each with its own bottle and purpose. This set contains everything you need in one place - a cleanser, ampoule, sheet mask, and creams. It even tells you which order to use them in. Use this first and once you are familiar with the steps you can branch out and try different brands. (or add more steps!) I should also note that you may want to add in a toner after Step 1. And for those already familiar with K-beauty: take this when you go travelling. It's SO much easier than squeezing 10 tiny bottles into your 3-1-1 Ziploc. Skinfood Black Sugar Serum (Light) - Okay so your face is cleansed and toned, now what? There are a million and one serums and essences you can use for the next step, some thick and some not so much. Whatever you want to use is up to you and your skin. My skin prefers the lighter stuff, and this serum feels oh-so-nice. It contains black sugar and Cheongju, a traditional Korean wine. Together they quickly absorb into your skin to provide immediate hydration. It has a refreshing scent and I did not find it be the slightest bit sticky - a huuuge plus for me in this humidity. Mirai Clinical Body Spritzer - This is probably the first thing I've ever gotten in a 3B Box that had an all-English description and ingredients list. Having a warehouse in the US probably has something to do with that. Mirai is a Japanese brand that focuses on the "less is more" concept. Their products contain as few ingredients as possible to reveal naturally beautiful skin. This spritzer has persimmon extract which fights body odor (including noneal odor, aka that "old people smell"...seriously, it says that) and leaves behind a fresh grapefruit scent. It's also worth noting that a bottle of this was given out to Oscar nominees at this year's Academy Awards. Haha, reading those last two sentences together made me chuckle. Teehee. Well it definitely has a hint of citrus in the bottle, but doesn't smell so great otherwise. Not to me, anyway. It reminds me of old spilt juice. I guess that could be better than noneal odor? Milky Dress Premium Brightener - 3B Box almost always contains foil packets but unlike some other subs, they always include enough of the foils to last a week or more. Brighteners help to even out skin tone by lightening dark spots and circles to make your skin look healthy and youthful. To be honest, I have yet to find a brightener that gives any discernible results whatsoever, and I'm pretty sure my skin tone is far from perfect. But then again, I'm really bad when it comes to consistency in keeping a particular product in my routine. Yup, it could all very well be user error. 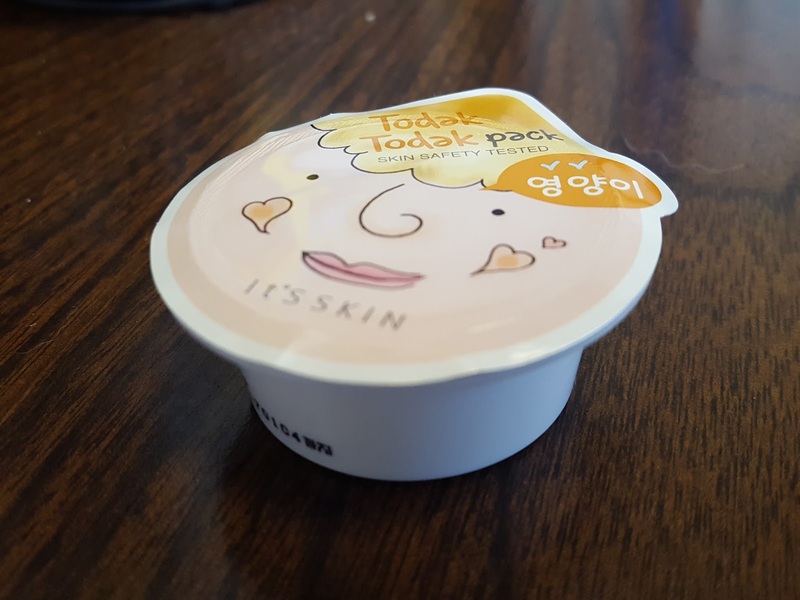 It's Skin Todak Todak Pack (Nutrition) - It's Skin makes several Todak Todak pack versions for different purposes including oil control, moisturizing, elasticity, and firming/vitality. This one has honey & coconut to soften and calm dry skin. It's a tiny pack, but a little goes a long way and one pack is actually good for two uses, maybe three. I think I'm most excited about the Skinfood serum. I've had very positive experiences with Skinfood products and I love that they're made with food ingredients. Because foooood. The Todak Todak pack also looks fun. I see 'em all over the interwebs but never got around to trying one. Now that I have one in my hands I'm so excited because they're ooey and gooey and who wouldn't want to put something that looks like Jello on their face?! Subscribe to 3B Box here! You'll get fun things like jelly masks and silkworm finger balls. And for $12/month including shipping, you'd have a hard time finding a better bang for your buck in the US. You are so like me! I hate throwing things away even if I hate them, too!! It just seems so wasteful! I finally tend to cave when I get a whole crop of things hogging all my space but being useless and toss them. That whole "old people" smell thing cracked me up so hard when I read it. Mostly because who on earth talks about that and then because it's true. Of course I think lots of perfumes smell like old ladies but that's probably different. Heh. I LOL'ed at the old people thing too when I read their website! I got visions of a nursing home demographic. Hah! And I laughed even harder after finding out they gave it out at the Oscar's! !